Striker Shaquile Coulthirst is fouled by Fleetwood's Nathan Pond to earn Posh a penalty. Photo: Joe Dent/theposh.com. Peterborough United manager Graham Westley threw so many punches during a fiery post-match press conference last night (April 5) Tyson Fury would have been knocked over. Westley was, quite rightly, apoplectic with his side’s display in defeat at Fleetwood, a mood that was probably matched by the 130 or so Posh fans who had made the 400-mile round trip at a three-figure cost to stand in rapidly-decreasing temperatures to watch such a witless, passion-free, half-hearted display by their favourite team. For them the longest away trip of the season turned into the longest night. Posh left-back Kgosi Ntlhe is held at bay by Fleetwood right-back Conor McLaughlin. Photo: Joe Dent/theposh.com. Take nothing away from Fleetwood. It wasn’t the greatest surprise that their desire to stay out of the relegation zone was far greater than Posh’s desire to move into the top half of the table, but they harassed and hounded their visitors with such ferocity, a 2-0 final scoreline was the least they deserved. 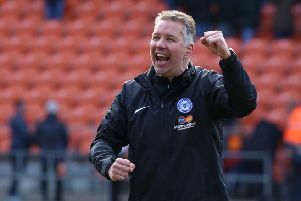 Posh have little to play for except professional pride for the rest of the season, but five days into April is rather early to dream of sun loungers on the beach. Westley is rarely short of an appropriate word or two and ‘insulting,’ ‘unacceptable’ and ‘appalling’ were three of his chosen adjectives after the game in a rant that allowed no argument. The manager picked an aggressive, attacking team that in hindsight placed too much pressure on midfielders who lacked the skill, vision or the energy to cope with superior athletes and too much onus on forwards who lacked the touch and technique to hold the ball up and relieve some of the pressure on their colleagues. Chris Forrester, the sole midfielder blessed with the class and composure to withstand tenacious opponents sat unused on the substitutes’ bench, understandably so given his lenghthy run of action without a meaningful break, but frustratingly so for those who like to see the best players on the pitch. Posh substitute Martin Samuelsen tries to wriggle through the Fleetwood defence. Photo: Joe Dent/theposh.com. Westley’s 4-2-3-1 formation was made to look vulnerable at times by bottom club Crewe at the weekend (April 2). Away from home in front of a small crowd and against a well-organised Fleetwood side it proved be a selection made in hope rather than expectation. Fleetwood cut out the preferred Posh option of passing out from the back and immediately pressurised anyone brave enough to collect the ball in central areas. Only the home side’s lack of finishing ability stopped this becoming an embarrassing rout. Remarkably Posh even won a penalty two minutes before the break following a terrific 45-yard burst by Shaquile Coulthirst which was interrupted illegally by Nathon Pond, but for once Michael Bostwick failed to get elevation or power into his spot-kick and Fleetwood ‘keeper Chris Maxwell stood his ground to kick the ball clear. That would have dragged Posh undeservedly level at half-time and who knows what effect that would have had on a team fighting for their lives? Instead Fleetwood became even more dominant after the break with only Bobby Grant’s wasteful finishing keeping the final scoreline reasonably respectable and disguising, slightly, the ineptitude of the performance, until the manager started talking at least. A wide open start to the match when long shots at goal from Grant, Jimmy Ryan, Wes Burns and Stefan Scougall were countered by 20-yard efforts from Marcus Maddison and Coulthirst, which required saving by Maxwell, soon became a contest dominated by the home side, although they rarely penetrated the centre of a Posh defence, marshalled on this occasion by Bostwick and Gaby Zakuani. But eight minutes before the break a quick exchange of passes between Burns and Grant enabled the former to spin and expose Bostwick’s lack of pace before delivering a fine finish into the corner of the net. Fleetwood had to wait until midway through the second period before extending their advantage when a free kick was helped on by Stephen Jordan for fellow defender Eggert Jonsson to head a bouncing ball past Alnwick. Substitute Jon Taylor almost found an instant reply with a 25-yard strike that was deflected just the wrong side of an upright, but there was to be no nervy finish for the home side, much to the dismay of Westley and one of his predecessors Darren Ferguson, whose Doncaster side look doomed to the drop. In-form Maddison ran into a mobile and skilled marker in Amari’i Bell so his influence was negligible and Posh had no-one else able to take on the attacking mantle. Coulthirst’s attitude and spirit stood out among the Posh players, but there was no vision, no creativity and no spark as a run of three wins in a row came to a shuddering halt. Westley refused to offer excuses for the performance - the traditional apology came on chairman Darragh MacAnthony’s Twitter timeline. Westley fielded a back four and goalkeeper with over 1,200 first appearances between them, who were allegedly protected by a 31 year-old midfielder, so lack of experience wasn’t a factor. This was all about ability and desire and Posh had worryingly very little of either. The rest of this season might just be an audition for a planned promotion push in the 2016-17 campaign. It’s certainly an idea to pick players who are certain to be at the ABAX Stadium then, as well as those who want to be here. Kgosi Ntlhe was therefore a surprise selection at left-back. When he delivered the crude challenge which earned him a yellow card in the second-half, it was wasn’t just the home fans who were yelling for a red card instead. Posh: Ben Alnwick, Michael Smith, Kgosi Nthle, Gaby Zakuani, Michael Bostwick, Simon Gillett (sub Martin Samuelsen, 64 mins), Harry Beautyman, Marcus Maddison, Lee Angol (sub tom Nichols, 76 mins), Shaquile Coulthirst, Aaron Williams (sub Jon Taylor, 54 mins). Unused substitutes: Mark Tyler, Erhun Oztumer, Ricardo Santos, Chris Forrester. Fleetwood: Chris Maxwell, Conor McLaughlin, Stephen Jordan, Eggert Jonsson, Nathan Pond, Amari’i Bell, Jimmy Ryan, Wes Burns (sub Tyler Forbes, 86 mins), Bobby Grant (sub Ashley Hunter, 90 mins), Antoni Sarcevic, Stefan Scougall (sub David Ball, 73 mins). Unused substitutes: Marcus Nilsson, Alex Gogic, Thomas Grant, Devante Cole. Goals: Fleetwood - Burns (38 mins), Jonsson (68 mins). Cautions: Posh - Bostwick (foul), Gillett (foul), Angol (foul), Ntlhe (foul).